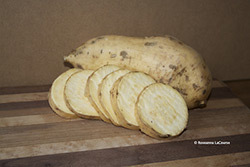 We are pleased to offer certified organic sweet potato slips, small plants that sprout from the roots. We have chosen four varieties that have been grown successfully in our northern climate. 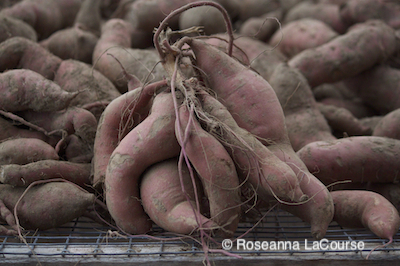 Imagine eating your own sweet potatoes with your family over the holidays! 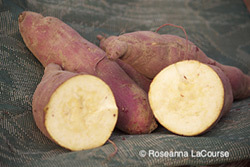 The sweet potato (Ipomoea batatas), a vining plant related to morning glories, is a different plant species than the familiar Irish or white potato (Solanum tuberosum). The part of the sweet potato most widely eaten is a swollen portion of the root, which forms in the hill of soil. Leaves and growing tips are also edible, usually stir-fried. By contrast, white or Irish potatoes, whose leaves and stems are poisonous, produce nutritious tubers on the ends of the stolons, or shoots, which form above the seed piece in a hill of soil. (True yams [Dioscorea spp.] are native to Africa and not grown in this country.) 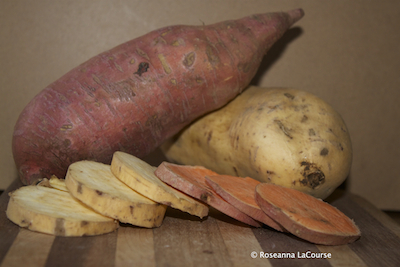 Sweet potatoes require 90-120 frost-free days to mature. Nutritious and productive, they can yield up to two pounds for each row foot of plantings. Plant the slips 15"-18" apart when the soil is at least 60°. Northern growers can be successful with sweet potatoes by using black plastic to warm the soil and by applying row cover to prolong the growing season. We ship sweet potato slips according to the zone chart below. Please note that orders are filled on a first-come, first-served basis. If we can't fill your order in the weeks of May 13, May 20, or May 28, we will do our best to fill it in the week of June 3. All orders that include Burgundy and/or Orleans will ship in the week of June 3, 2019, even when those orders include other varieties. We make our best effort to fill every order, but due to unpredictable weather and slip production, demand sometimes exceeds supply. We reserve the right to substitute Orleans for Beauregard as needed. Please see "Availability of Live Plant Material" on page 30 for more information. Handling and growing instructions are included with each order. 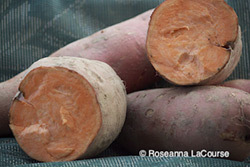 We are unable to ship sweet potatoes to AK, CA, or HI. Browse these categories under "Sweet Potatoes"